Wow, I’m writing theses lines and my little baby girl (now toddler, to be precise) is 1 year old. I must say, it feels like quite a big thing to me as her mummy and brings up a lot of sweet memories.. of my first pregnancy which I really enjoyed, giving birth naturally, starting our breastfeeding journey, the first sweet weeks after we came home from hospital and suddenly were a family of 3. 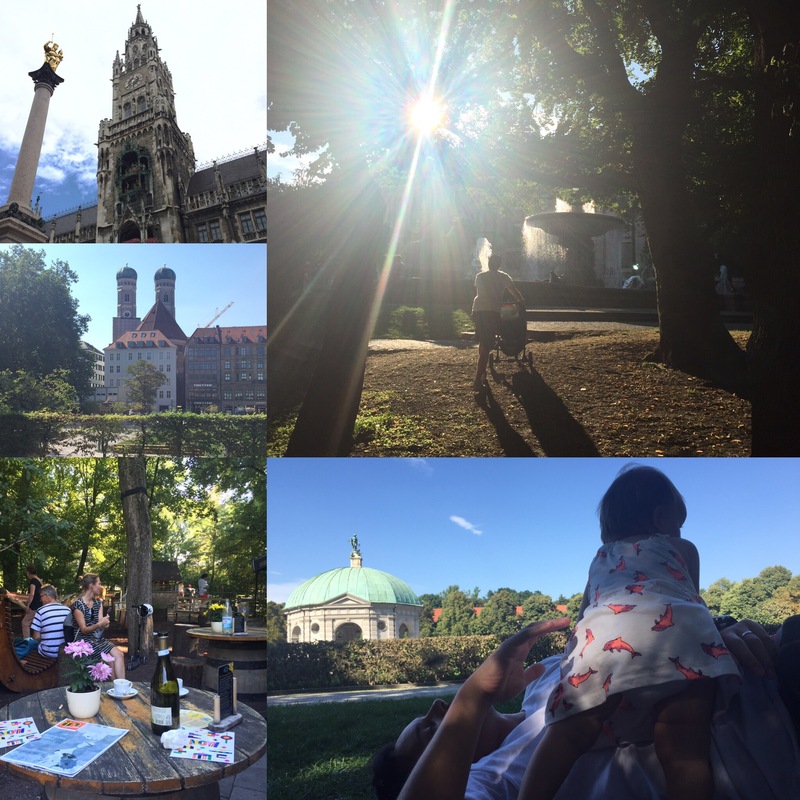 One whole year full of firsts, cuddles, joy, fears, happy moments, astonishment, – the list won’t stop. It is indeed a wonderful, enriching, heart and soul touching experience to be a mum, yet the most demanding and exhausting at the same time. Our month of traveling in August showed me that once more.. things are different now. I can’t just make my plans as I used to – or I’ll pay for it 😉 As much as I enjoyed being in different places every few days (oh Lake Garda, Austria, Munich – I miss you and your green and your people already!!! ), it completely messed up Zoe’s sleep and eating structure. The nights got worse and worse, eating messier and messier. At some stage I was so exhausted that I started nursing her again at night just to get back to sleep which also didn’t help anymore at some stage. My hubby introduced then taking her out of her crib, cuddling and rocking her back to sleep instead which was just as bad.. If I learned one thing, it’s planning our next holiday differently. When we came back to Malta beginning of September I was happy and filled up with green, lovely vibes from family and friends but a sleep deprived, emotional wreck at the same time. It was time to get some consistency and structure back to our life! Thank god I immediately started getting help. First, I got some supporting homeopathic remedies for myself (I’ll never stop recommending the lovely Ashley from Tigne Holistic Centre). 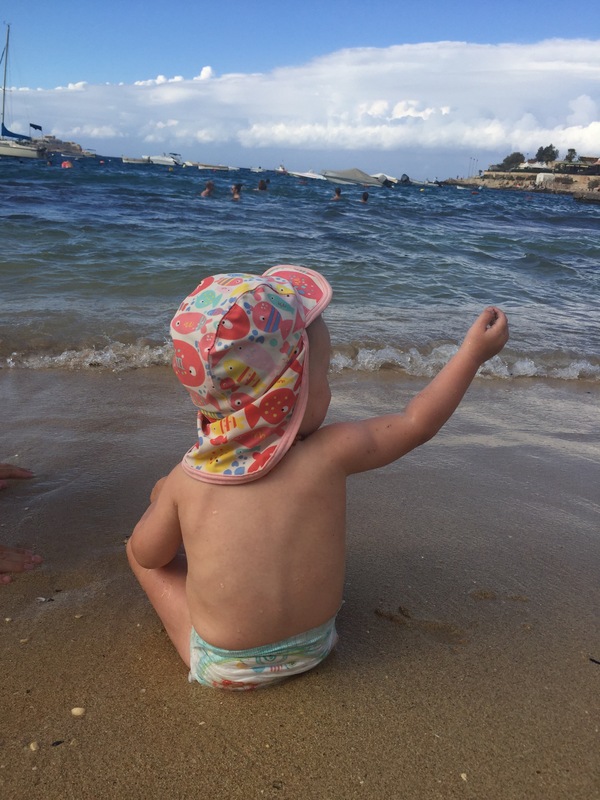 Second, I found a sleep trainer for Zoe (look up Daniela Sleep Coach if you’re in Malta and in need of getting your nights back) and I must say her tips, being more consistent and spending more time at home really made a big difference. Plus I finally gave in and go to bed now earlier which makes getting up at 6.30-7am not that bad anymore. So mind you, I don’t wanna jinx it, but touching wood, Zoe is back to better nights, longer naps and better eating and I feel more calm and centred again, too. Gosh! The joys of motherhood, it’s a rollercoaster sometime, isn’t it? But I must say, now that I’m feeling like my usual self things look a bit brighter again and getting little time outs make me enjoy Zoe even more. She now climbs up the sofa, walks long the bed and loves to dance and clap to her favorite songs. To be with her and seeing her doing these little things is happiness and joy at its highest level and I’m super grateful things improved just in time for her 1st bday which we celebrated at a little picnic at Buskett Gardens surrounded by her small and big friends ❤ Not the lush and green kind of forests we’re used to, but better than nothing! Of course she had to get a bday cake, but it wouldn’t be me if it wasn’t a healthy one! 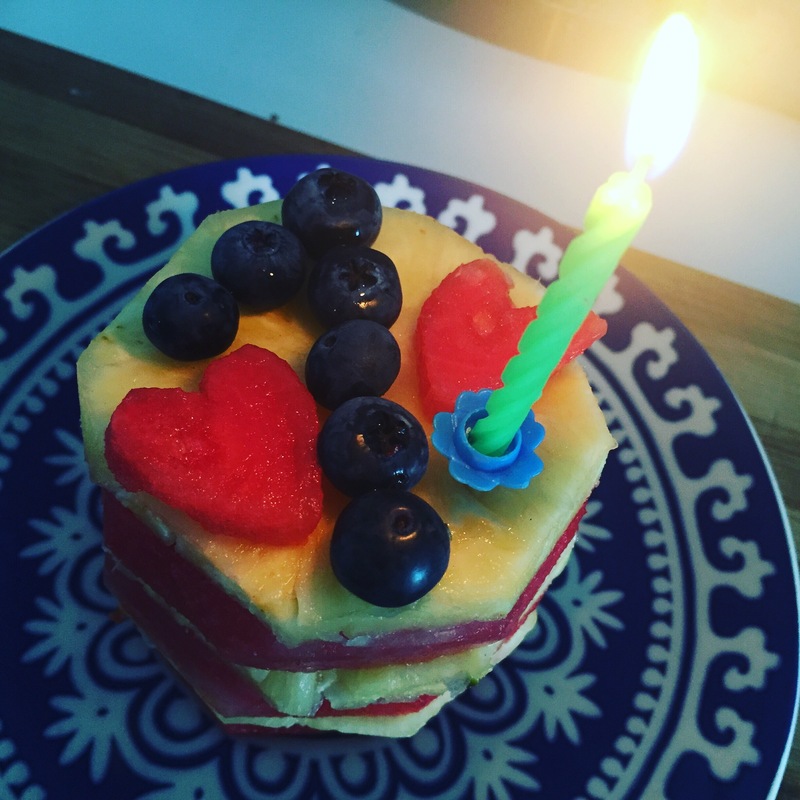 So I made her a little “raw” cake of just fruit and she and the other little ones loved it 😉 You should have seen her eyes when she saw the candle!! So, this has been it from me for today – you can see it was a rather exciting time again and of course I won’t let you go without a yummy recipe, too. 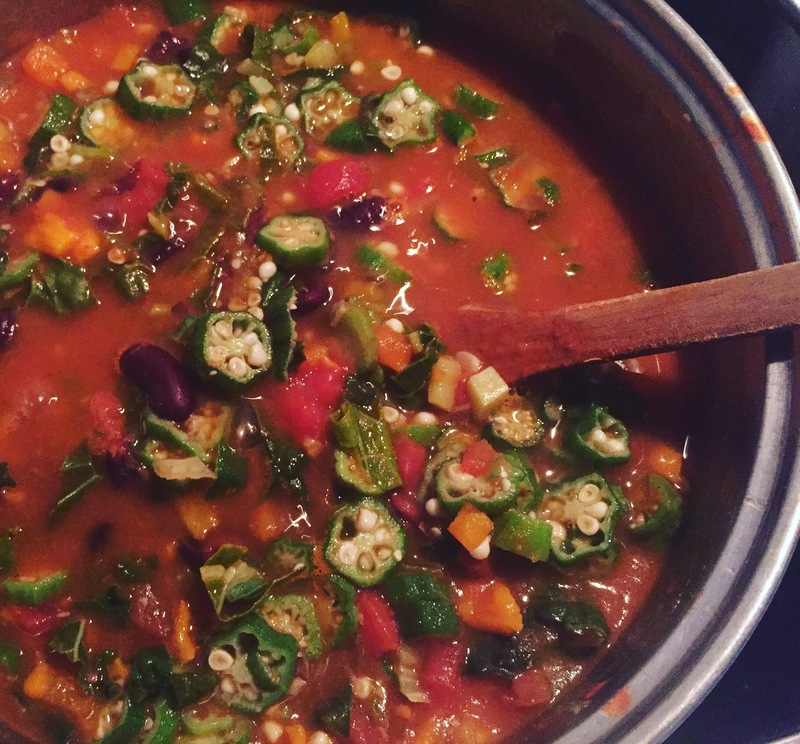 This time a wanna share a lovely Okra & Bean Chili recipe with you, loaded with lots of great organic veggies from the lovely Incampagna and Back to Basics. Thanks ladies for working so hard to make our life healthier! Saute slice okra in a large pan until it begins to brown. Add chopped spring onions and garlic, until they soften. Then add the other chopped vegetables, then the spices (amounts to your liking – I would recommend start with a teaspoon and add more if you like stronger flavours). Lately add the can of tomatoes (if using fresh, add them chopped and a bit of water plus tomato paste). Simmer until all veggies are nice and soft, but not mushy. Have a final taste and season with salt to your liking. For the avocado topping mash the avocado, add some chopped spring onions, lemon or lime juice, salt and pepper. Serve with brown rice or another side of your liking and a dollop of guacamole. Until next time enjoy and never forget what Charly Chaplin said “Nothing is permanent is this wicked world, not even our troubles”. Sending love & good vibes to all of you who need it!